The Milwaukee Journal Sentinel has made some changes to its Sunday edition. Sunday comics section became a part of their “Fresh” section. Our Sunday Fresh and Comics sections have been combined, with Fresh in front and Comics in back. Our weekly “At Home” decorating feature will now appear every other Sunday, alternating with the “Fresh Ideas” column of home improvement tips. We’ve kept all the puzzles but cut four comics. It is a choice some other newspapers have made to save money. doing so to the Business and other sections has long been a common practice. 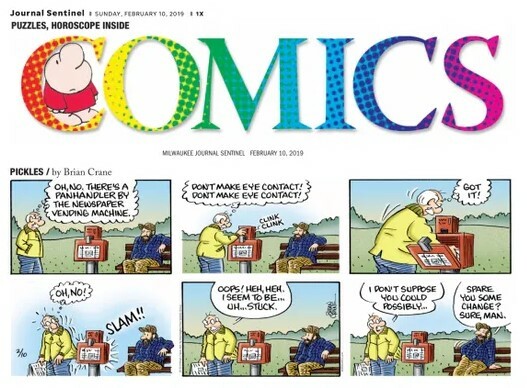 So once again, after almost two years, the Milwaukee Journal Sentinel Sunday Funnies will return (beginning February 10, 2019?) as a stand alone section. 26 queries in 0.117 seconds.